A very nice hotel with love in each detail. :-) Very lovely and helpful owner & staff. 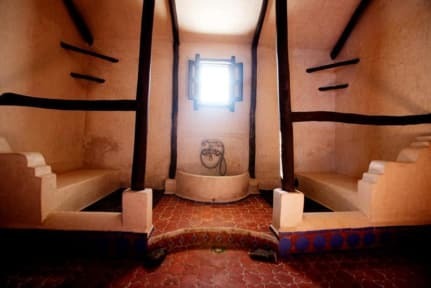 It's relaxed and calm – an oasis in the heart of chaouen. Clean, cozy, free wifi, nice breakfast and mint-tea included, wonderful jungle-garden and rooftop-terrace. We didn't want to leave! Until now the best hostel of our trip, totally recommended! The hostel is easy to find at the edge of the medina. The rooms are clean and decorated nicely. There is a small garden next to the riad which we couldn't use because it was raining all day long. The staff was really attentive and helped us booking our night train. The breakfast is rich and delicious. We felt really comfortable in this hostel and can recommend it to everybody. Super Frühstück- ausgiebig und abwechslungsreich :) Einchecken konnten wir früher als angegeben. Dachterasse bietet einen schönen Blick über die blaue Stadt. Das Hostel ist sehr gemütlich in blau eingerichtet. There are always things which are mainly making your stay in a place. Here it was the owner. The owner of the place was just so nice! He was so friendly and had such a good french. Location is really good! You cant have a better location in the Medina. Roof is also nice. Wifi is horrible. 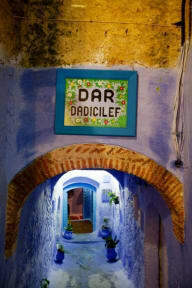 But it seems to be a chefchaouene problem. Its not a backpacker hostel though. No hostel atmosphere. So, if you want a quite chilled stay, that place is a good choice for you.